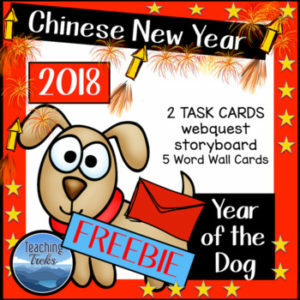 Chinese New Year freebie contains the following printable activities: a webquest, two fun thinking trek task cards, a Legend of Nian storyboard and Chinese New Year vocabulary on 5 Word Cards. The cards are suitable for Word Walls and associated learning activities. Visit www.treksntrails.info to find a Chinese New Year pathfinder for kids. The freebie is a sample of my Chinese New Year Teaching Trek, which contains Thinking Treks – 24 thinking task cards and a student Trek Tracker to keep track of activities completed, mapping/art printables, 50 word cards, printable posters and no prep student worksheets. Get your students thinking about Chinese New Year!